Organizing the information required for this can be a daunting task, but thanks to ExpressIFTA.com, it has become a much easier process. 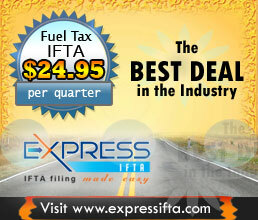 Vehicles required preparing an IFTA return must keep track of miles traveled and fuel purchased in each state or province. Because of the difficulty of keeping accurate records, and filing this form appropriately many drivers unfortunately receive IRS audits because information on their IFTA return was incorrectly recorded. Fortunately ExpressIFTA.com, along with providing spectacular service for IFTA Tax preparing, will perform an internal audit of your information for you. They also provide online trip sheets for drivers to keep accurate records that can be accessed from any computer, anywhere! You can’t afford to get audited by the IRS because of incorrect information. Let ExpressIFTA help get it right.